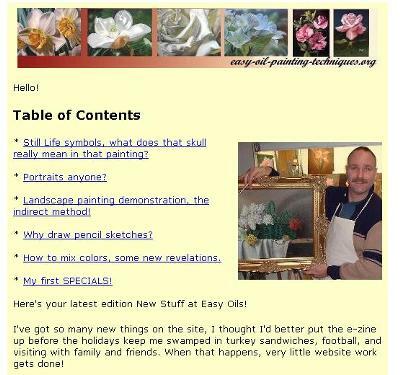 Oil painting lessons Ezine back issues: will you keep this list "forever," so that it may be accessed in the future? THANK YOU FOR SHARING ALL OF YOUR INFO....your talent is awesome! Well, as long as I'm physically able to maintain the site, these ezine's should be available to those that sign up for them. But like anything, stuff happens! I believe too, that at the bottom of the ezine is a link to gain access to past issues as a web page. You can then simply bookmark these into a special folder with-in your browser and name it "Easy oils Ezines!" or whatever name that would help you remember their location. Gosh, I went back and checked on these old issues, the 1st one was published back in July of 2009! I clicked it, and sure enough, it was the very first issue. Site Build It (the folks that host and provide support for this website) really know how to put a great package together, and keep it together. I'm not sure how you can get the E-zine "re-mailed" to your email address. That would be a cool feature, but I don't see any links or a way that it can be done. The best insurance I can think of would be of course, to buy the e-book! (Sorry, I couldn't help myself) ;), but think about it. The techniques and information on the site are all based on the technique taught within my e-book, "The Real Art Lesson". If you get the CD version, no matter what happens to your computer, it's safe on the CD in your library of software.